There’s nothing so satisfying as going to a gig and telling someone there that you are ‘friends with the band’. Of course you drop it in there as casually as possible and change the subject quickly: but it’s out there. However cool you were ten minutes ago, you’re just that little bit cooler now. 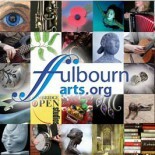 So what happens when the local musical royalty does their stint in this great series of Fulbourn Art gigs? You might think that the ‘friends with the band’ magic wouldn’t work anymore – well you’d be wrong. Dave and Lynne Olney, Nick Barraclough, Jon Betmead and Rob Appleton – musicians quoted from stage right to left – began the set with some keystone capers and played down their own significant musical achievements. It’s clear we are all in on the jokes but when they warm the audience up with ‘Stay Young, Keep Your Wheels In Motion’ the four guys and one girl get seriously into the music. The Famous 4 Plus 1 play acoustic pop harmonies, with Nick claiming it’s the only band that will let him loose on his mandolin. The songs and ballads skip back and forth through time – Gallagher and Lyle, Norah Jones, the Beatles, James Taylor, Sting, Bobby Freeman and the Allman Brothers all making appearances by turns – you’d be hard stretched to predict what the band had next on the set list. The confident female lead holds the solo vocals in the torch songs while the gents take turns on the microphone in other tunes – the band often doubling and tripling up on the harmonies. The F4P1 feed bass, guitar and mandolin into the mix with some great harmonica and ferment something wonderful. “The nice thing about now – when you may begin to doubt you are going to crack the big time – is that you can play with your friends.” Says Dave and then gets the crowd to help celebrate Lynn’s birthday with a rendition of ‘When I’m Sixty-Four’. Friends of the band may argue with him about cracking the big time but what we’d really like to know is when can we see them again? ‘The Famous Four + 1’, comprised of Lynne Olney, Jon Betmead, Dave Olney, Nick Barraclough and Robb Appleton, were warmly received at The Six Bells, Fulbourn, on Friday the 11th of June. Their music was a striking blend of many genres with influences ranging from jazz to folk, which resulted in a refreshingly different outcome. The music was somewhat lilting in nature, which made it feel natural: it was very easy to lose yourself in their almost hypnotic tones. The whole group singing, acapella- style, during the choruses of some of the songs was also extremely effective. ‘The Famous Four + 1’’s songs ranged in style with a subtlety that ensured that the unique tone of their group was not lost. Their repertoire contained songs that varied from well-known classics to less-well known tunes. No matter how well known, though, their versions were always very much their own. The band had the crowd with them from the moment they entered the stage being heartily applauded and warmly received throughout. They effortlessly involved the audience and created an easy, relaxed and very friendly atmosphere that got the whole room smiling and joining in with the songs they knew. The stand out tracks would be, in my opinion, ‘Stay young’, an uplifting and upbeat number, ‘Blackbird’ – the cover they did on this was particularly lovely – and ‘Fields of Gold’ which I thought to be another excellent cover that was very pleasurable to listen to. It also happened to be the birthday of one of the vocalists, Lynne Olney, and birthday songs and cake added to the warm atmosphere. As a young person I found the music extremely enjoyable and was surprised by the sheer classic timeless quality. This type of music is not often listened to by teenagers but I and the other young people with me really appreciated the music of ‘The Famous Four + 1’.